Handwriting is a system for symbolizing the words, languages and is being used from centuries for Individual identification because of its distinguishing features. 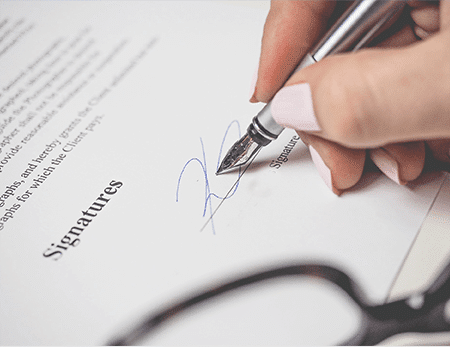 Signature and Handwriting are widely used as a means of personal verification. Both are unique and are a method of human identification. No two people have identical handwriting characteristics and no one person writes exactly the same way twice. DNA Forensics Laboratory Pvt. Ltd. provide variety of tests for signature verification involving alleged fraud, forgery and cheating, insurance claims, authentication of wills, etc. Whereas in the case of handwriting verification we include signature analysis, document analysis, document alteration analysis, stamp analysis, loan application analysis, handwriting analysis, cheque analysis, legal document analysis, counterfeiting, suicide note analysis and many more. When it comes to conducting a thorough investigation, our experts examine all the pieces of the puzzle to produce a clear history of the unknown. From the largest piece of evidence to the smallest, our examiners are precise, cautious, independent and patient in viewing all of the evidence in the case. At the arena of Globalization, it is easy to form fraudulent documents by copying the handwriting or signature of an individual. Therefore, there are more chances of cheating in any field including business, legal and finance. Forgery is a crime. The signature may be valid but the manner in which it has been acquired may be fraudulent. DNA Forensics Laboratory Pvt. Ltd. team uses the latest and most sophisticated methods in identifying and proving authenticity of signatures and to detect and analyses forgery in signatures. DNA Forensics Laboratory Pvt. Ltd. determines if the document is genuine or forged. We use specialized techniques to examine the documents like detecting alterations, additions, erasures and obliterations, and the paper, ink and printing substrate. We also tell the creator of the document, the time frame, material used and the modifications made. We have team of experts who identify marks that are hidden to the naked eye. Our customer representatives always answer any questions you may have and provide relevant advice according to your needs. Call us at: +91 8010177771 or +91 9213177771 for further inquiries.